ResidentDante: Keep control of your layers! Review: This time for my retroactive review I'm going back to a lovely shoot 'em up, or schmup for short, on the Sega Saturn. 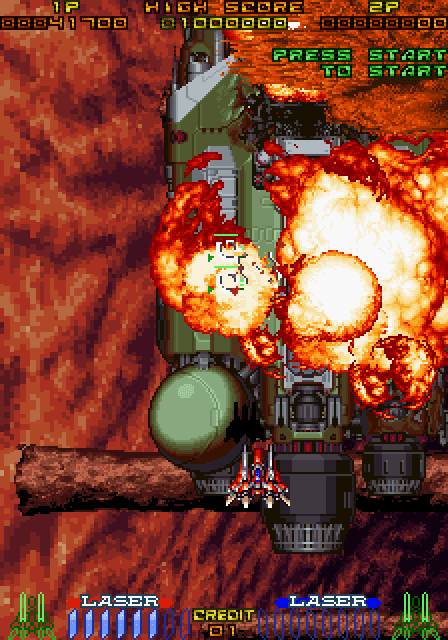 While there are a ton of schmups made through the years, this game features a rather neat gameplay mechanic. Firstly though, let's get the confusion of the title out of the way. It's original arcade release title in 1994 was Rayforce in Japan and the U.S., while in Europe it's titled Gunlock. For the home conversions it's titled Layer Section in Japan, while in the U.S. and Europe it's goes under the name Galactic Attack. I guess somebody forgot to file a title trademark for each region along the way?! Luckily the actual game isn't anywhere near as confusing as it's many titles! I'll refer to the game as Layer Section as that's the name on the cover of my Japanese Saturn version and it actually explains the game's main mechanic quite well; shooting enemies in two layers. You've probably played many games in this genre before and although the rely heavily on the same principles, sometimes they feature some cool new mechanics that set them apart from the competition. Layer Section is such a title. 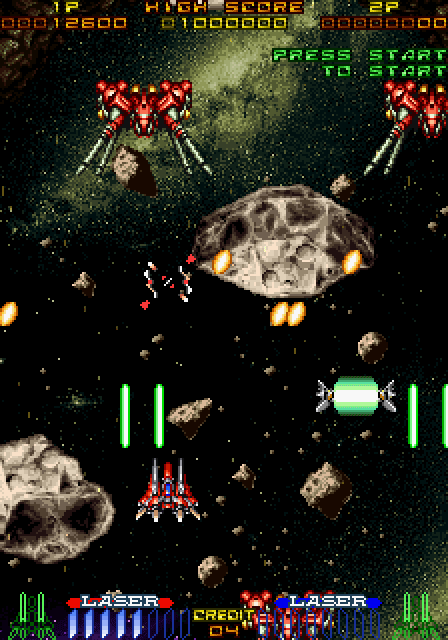 Schmups typically let you command a spaceship or airplane, shooting numerous enemies scrolling down towards you on the same plane. However, in LS you have the spaceships main gun for the enemies straight ahead on your plane, while underneath you on the ground is another layer that requires you to lock onto enemies below with a laser sight and fire to hit them. It gives a neat depth to the picture and a neat variation in attack methods. There's no super weapon here, like a mega bomb or anything, so the controls are very easy to grasp and simplistic; manoeuvre the ship with the d-pad, fire two different weapons with the buttons. In general there are three types of enemies; those who always stay on the lower layer, those who rise up from the lower to the top one and those that are only on the top layer. This gives way for some hectic gameplay moments where you try firing at stuff in both layers at the same time, luckily the bottom layer becomes something you almost do by second nature as you focus on not being hit by bullets on the top layer. The enemies that rise from the bottom to the top layer often require just one hit by laser as they rise, then when they reach the top layer they require quite a bit of bullets to take down. As such you are often rewarded to quickly, and hectic, take enemies down before they reach the top layer. Controls are super tight and fast, your spaceship is perhaps a little large in pixel count for my taste, with it's hitbox being a bit smaller, confusingly enough, but not uncommon in the genre. 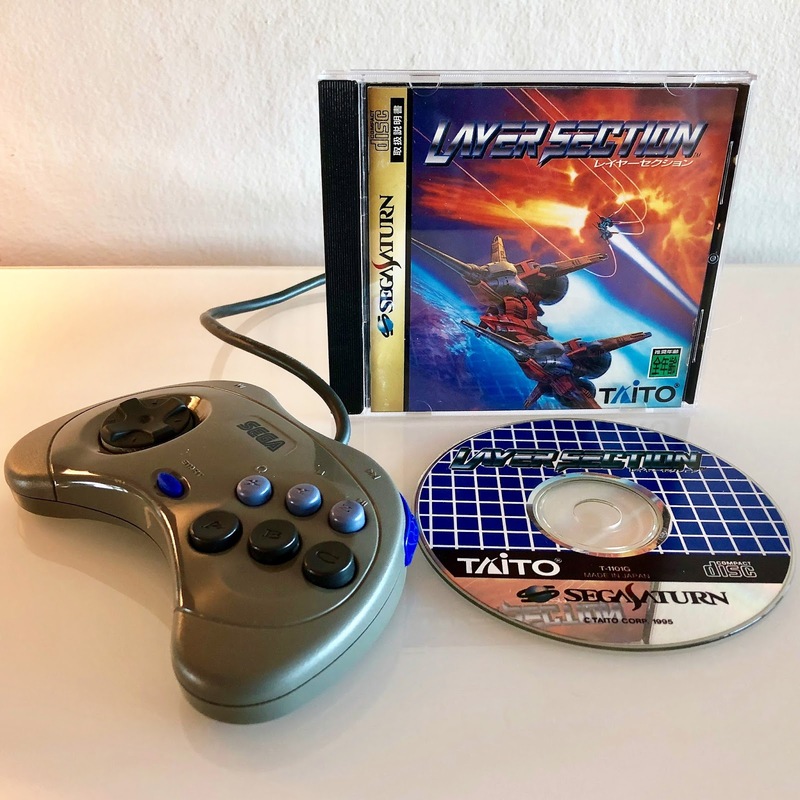 The Saturn's d-pad shows off it's strong side for this type of game; rolling your thump around it to avoid oncoming fire; making the precise movement a breeze. Let's face it; the Saturns controller features probably the best d-pad ever made and is a treat to use in 2D schmups like this. LS is a beautiful 32-bit 2D shooter. For those that have only roamed the 16-bit conversions of shooters on the Mega Drive or SNES, they're in for some really neat and detailed sprite graphics. Backgrounds and sprite layers scroll individually and are scaled around and rotated with ease on the 2D powerhouse that is the Sega Saturn. It's neat to play these advanced 2D games as they give a glimpse of what would have been if the 3D gaming revolution never happened. It's also a showcase in how the Saturn easily handled arcade perfect ports of 2D games that actually require a lot of hardware to run. Slowdowns and small, simply sprite models from the 16-bit consoles simply can't match this type of quality. 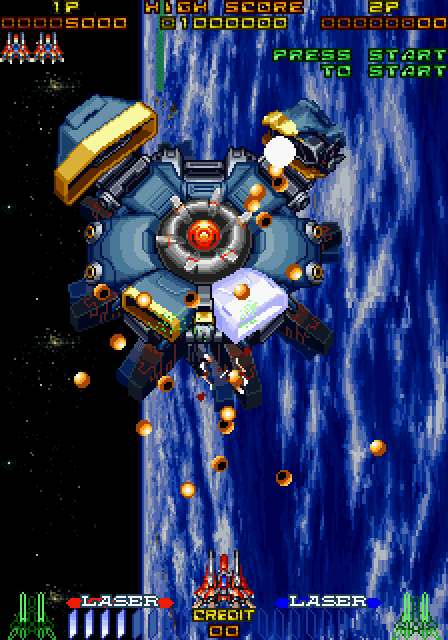 Be sure to play the arcade mode though, as the Saturn mode has some cutbacks. The game features a varied set of seven levels, with tons of detail onscreen and the depth effects with scaled sprites really help the picture "pop". There's also a pretty sprite drawn intro and ending sequence. There are literally tons of layers of sprites and scaling going on, all in 2D. 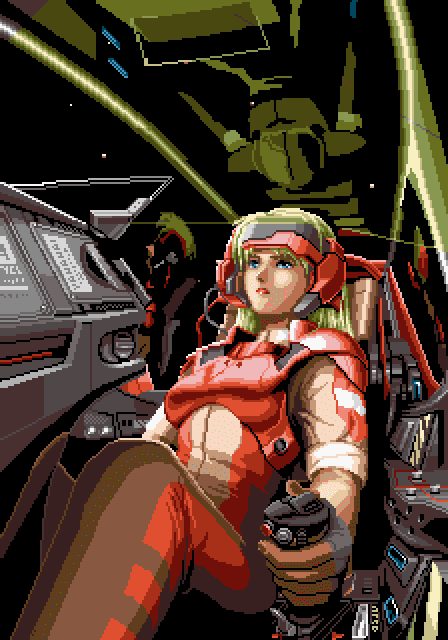 Sure the Mega Drive could handle a few layers and schmup gameplay speed, while the SNES could rotate and scale sprites, but this game is just on another level all together; sprites are thrown around at ease in the bucketload, scaled and rotated in manner that gives a almost 3D depth to the levels! Like most schmups, LS lets you progressively upgrade the power of your weapons by requiring pickups that are dropped by enemies. These upgrades are kept for each life lost, but not when you hit a continue. It's a insanely difficult game by all means and perhaps best managed in coop mode with a friend, there's a cheat to grant you 8 credits rather than the default 4, otherwise you'll have to resort to a Action Replay cartridge if you want infinite lives or invincibility. You're seriously going to get tested on the later half of LS, as the difficulty rises considerably. Presentation wise there's the neat Tate mode, which is the perfect arcade conversion, like a lot of the schmup ports on the Saturn and PlayStation 1. Tate turns your TV picture from 4:3 to 3:4, the format used for most scrolling schmups in the arcades. This lets you see enemies earlier on as the scroll down towards you, rather than the standard 4:3 which cuts away the top of the picture to fit the format. It's beautiful to see the game in it's proper format and it actually makes you see the whole size of bosses and help spot enemies. 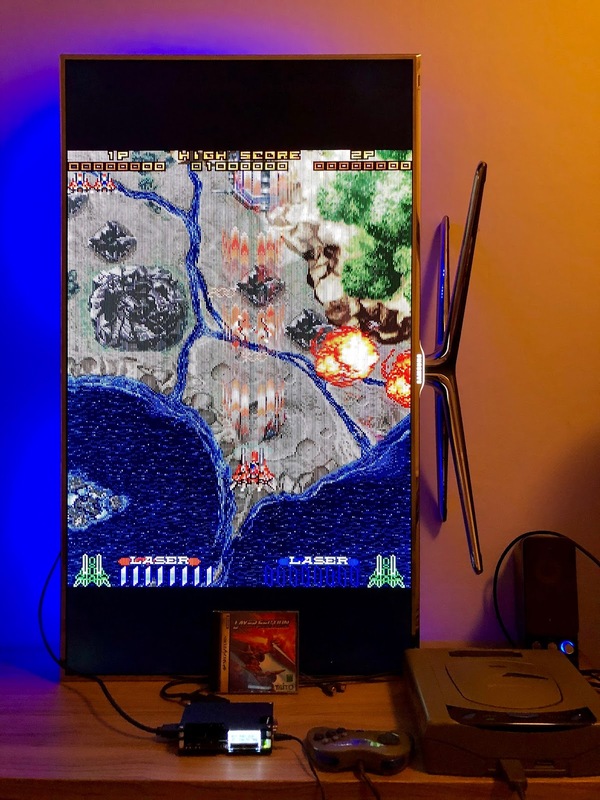 If tilting your CRT TV sounds scary, demagnetising it for the earths gravitation and all, then you can easily use a LCD flatscreen vertically without issues. All in all, Layer Section is a great looking and fun 32-but shoot 'em up with it's neat layer mechanic, hell I even liked the typical addictive early 90's midi soundtrack! It's still one of those titles that haven't raised to ridiculous prices, yet, like most games in this genre have on the Saturn. In hindsight such games often were overlooked and badly reviewed in the 3D craze that swept over the fifth generation, but look into the more obscure 2D world of that generation and you can find some great games that give a glimpse of the 32-bit 2D future Sega bet wrongly on. Sure, I would have liked more depth to a singeplayer experience so many years later and, but this is a pure arcade conversion; it's about trying to reach as far as you can on the lives and continues you get, beating that old highscore from the last time. "Just one more go" is the motto to go by.